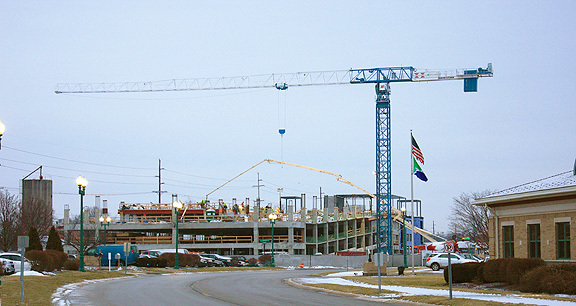 Project obstacles and solutions: A 400 space, four-level parking garage is part of the Loftus Robinson development in downtown Fishers, Indiana. The parking garage is a joint venture between the Town of Fishers and Loftus Robinson Development. Hagerman Construction was selected as the general contractor on this project. The parking garage floors were designed to be post tensioned decks. Much of this construction was done during the cold winter months. Post tension tendons were to be pulled 24 hours after the decks were poured. IMI designed a mix that used a high range water reducer, along with a corrosion inhibitor and Type 3 Portland cement to meet the demands of early strength in cold weather. Type 3 is a finely ground cement that is made for rapid concrete construction in cold ambient temperatures. IMI supplied 5,000 psi concrete for the decks. This needed to gain early strength of 3,000 in 24 hours before the tendons could be stretched. On the job site, Hagerman wrapped the lower floors in plastic sheeting and used portable propane heaters one level below the pour to keep the concrete warm during the initial curing process. After the troweling was complete, they covered the decks with blankets. In total, IMI supplied over 7,000 yards of concrete for the foundation, pillars, decks, podium walkways and stairs.